On the opener match of group D in Brest, Germany shocked defending champions Norway after a 32-33 victory and took the first two points of the group round. Emily Bölk scored the decisive goal with 20″ left and gave her team a much celebrated victory. 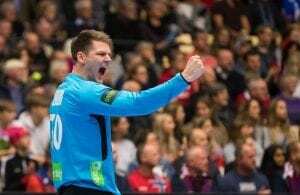 In a sold out Brest Arena, Germany upset the current title holders, who took their first defeat in EHF Euro competitions in nearly 4 years. The match was tight from the beginning, where none of the teams could take the lead clearly. Julia Behnke opened the scoreboard after 3 minutes and Kari Brattset tied shortly after. Norway would take the first two goal lead of the match through Løke in the 9th minute (5-3) after a very intense start from both sides. Germany stayed patient and by the 16th minute turned the result around (7-8). Thorir Hergeirsson had called the first timeout after 13 minutes and replaced Stine Oftedal and Veronica Kristiansen for Marta Tomac and Emilie Hegh Arntzen respectively. The change paid off as the Vipers Kristiansand left back scored 4 goals in a row to tie the match (8-8) and eventually take Norway to a 11-8 lead. But then a 4 minute goalless gap for the helped Germany get back on track and tie again at 11. The first half saw Norway leading 16-15 after a left-handed shot by Løke. On the second period Germany fought hard to take the lead after being -2 for the first 6 minutes (22-20). Behnke tied the score at 23 after 9 minutes and then the coached by Henk Groener had the lead for nearly 14 minutes, when Veronica Kristiansen, who had had a discrete match and was now in the right back position set the equalizer with a great break-through (29-29). Norway would re-gain the lead through Stine Oftedal (31-30) but it wouldn’t last long as Emily Bölk first and then Ina Grossman would help the Germans take an advantage with only 2 minutes left to be played. Debutant Henny Ella Reistad equalized (32-32) with her second goal of the match and Groener was quick to call for a timeout with 1:16 left. With passive play being called by Bonaventura sisters, Bölk shot from long range and set the 32-33 in favor of the Germans. Hergeirsson used his last timeout to set up the last play in the 20 seconds he had left. With seven players on court, the last ball was given to Marit Jacobsen, whose shot was stopped by Isabell Roch to unleash the euphoria of the German squad. Stine Oftedal was top scorer of the match with 7 goals and was also chosen as MVP.